RANDOLPH — The first trail running race on the 10,000-acre Randolph Community Forest is scheduled for Sunday, Nov. 1. The 10K Randolph Ramble will start at 10 a.m. on the new Randolph Mountain Club (RMC) Mt. Crescent trailhead at the end of Randolph Hill Road. The number of participants is capped at 100, including both speedy trail runners and Limmer Division hikers who prefer a slower pace. The first leg goes to the top of Mt. Crescent, next to the Crescent Ridge Trail, then to the Four Soldiers Trail, and back to the Jimtown Logging Road to the start point. “It’s a technical course, which essentially means rocky and rough,” explained Doug Mayer of Randolph, whose Run the Alps company is a sponsor. Self-sufficiency is one of the race goals, so everyone on the course will be required to carry their own water, wear a trail-running vest with pockets, snacks, hat, a shell of some kind, and a copy of the map of the marked course that will be handed out that morning. Tasty treats at the trailhead and lunch at a nearby barn at Mark and Katie Kelley’s place are being provided by the White Mountain Café and SAalt Pub, both in Gorham. The race and associated events over the trail running weekend will benefit the Randolph Mountain Club and a youth mountain biking effort being headed up by Jeremiah Macrae-Hawkins, also of Randolph, who is active in the Coös Cycling Club. Everyone who completes the 10K course will receive a simple finisher’s prize. Other sponsors include Borealchick Designs, Garland Mills, Lead Dog Consulting, LLC, Mount Adams Challenge, and Top Notch Inn in Gorham, which has overnight stay deals for Randolph Ramble participants. 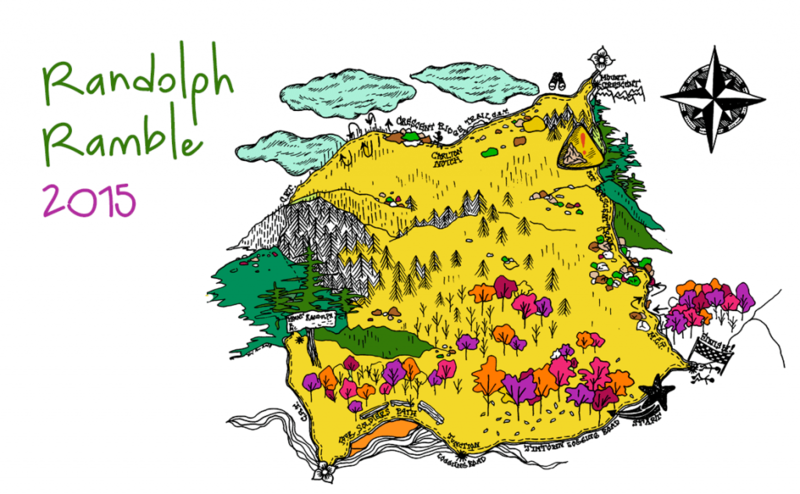 Randolph Ramble has its own Facebook page, and registration information is also on the Randolph Community Forest website. Sixty-five people have already signed up, leaving 35 spaces available. Gorham businesses are emphasizing the diversity of its recreational activities. The previous weekend, Friday, Oct. 23, to Sunday, Oct. 25, in Gorham the Coös Cycling Club has partnered with the Top Notch Inn on Main Street for a Mountain Bike Festival that includes guided rides, a short course race, and some social events. For more information, go to the CCC’s Facebook page.